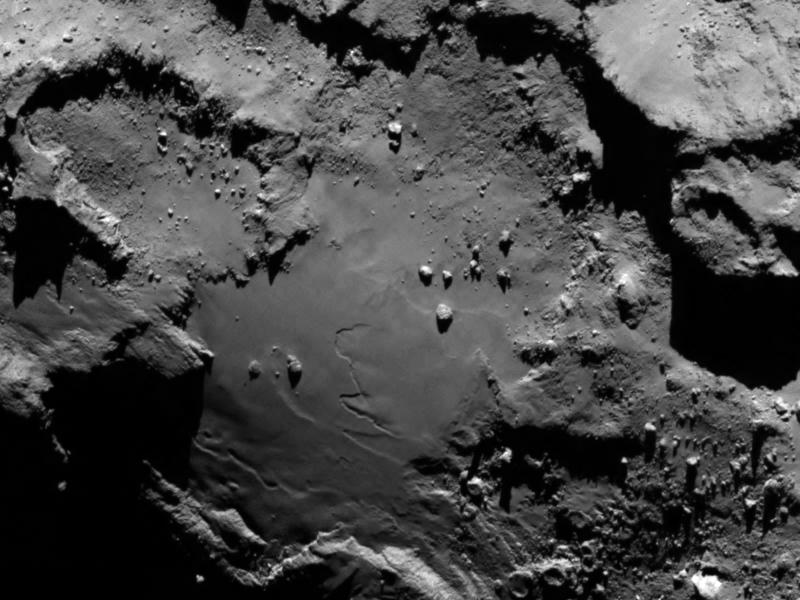 As the Rosetta spacecraft drops a bit closer to its target comet, some really cool features are popping into view. For example, look at this picture of a 150-foot (45-meter) rock on Comet 67P/Churyumov-Gerasimenko, which was taken in September and released today (Oct. 9). And it’s led to the decision to have an Egyptian theme to naming features on the comet. Scientists are still trying to figure out what the boulders are made of, and how they are formed, as the spacecraft moves into a “close observation phase” tomorrow (Oct. 10) where it is only 10 kilometers (6.2 miles) from the surface. Meanwhile, some new results are coming from an asteroid that the spacecraft whizzed by a couple of years ago. In the picture below, you can see evidence of a crater that Rosetta didn’t even see! The grooves you see there on Lutetia (which Rosetta imaged in 2010) hint at shock waves from various craters, including one that was likely on the hidden side of the asteroid relative to Rosetta as it flew by. The suspected crater is called “Suspicio.” While craters have been found in other asteroids visited by spacecraft, grooves are rarer. A paper on the research will be published in Planetary and Space Science this month, led by Sebastien Besse, a research fellow at ESA’s Technical Centre. For more information, check out this release from ESA. Impact stratification hints at chemosynthesis as HOT shock waves propagated through the strata? What elements might be expected to form under those conditions? Why are you not addressing the problems with missing comments? You are obviously loosing followers! Great photo of Cheops. Obviously poses more questions than answers. Which is what exploration is all about. Is this rock present due to erosion or is it a foreign object? If so,where is the evidence of impact? My favourite theory is the sub surface of Rosetta is a softer rock and the erosion has occured and created a ‘bowl’ shape with a harder rock ‘lip’. At some stage a fragment of this ‘lip’ has broken off and rolled into the bowl. Either way, impact or erosion, the gravitational pull of Rosetta is more than I imagined. Secondly, there appears to be a hole in Cheops! This is hinted at by examining Cheops shadow. Great stuff! I love a photo that asks so many questions of its viewer.